I had a wedding to attend last Sunday and just before heading out I decided to click a snap. Sharing the picture with you all. 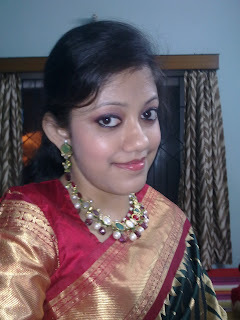 I wore a heavy zari silk in green and red with golden zari work.. 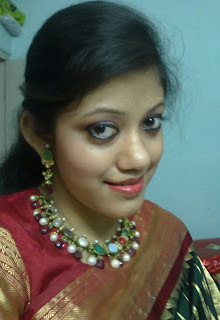 Although I dont have my full outfit pic but will update it soon because one of my friend took a full snap of me and will take it from her...For the eye I just did a golden and red shadow and kept the face makeup pretty simple with a peach color lipstick. For the jewellery I wore a Nav Ratan Set. As the sari was gorgeous and heavy so kept my jewellery simple and chic :). See you next time with a review super soon. till then byee and take care.. Lots of love.